Travel within Sal is simple by taxi, which should cost no more than £5 by day or £8 at night. 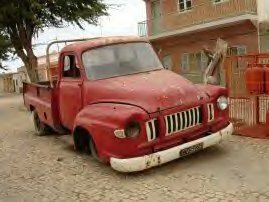 Until recently taxis would not cheat customers who do not speak Portuguese but reports suggest that this may be changing. So check the price first in euros. Alternatively you can flag down an Aluguer - usually a Japanese minibus or open pick-up with seats in the back. 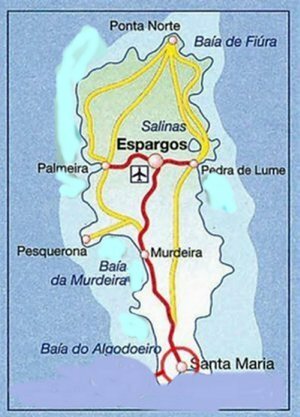 These cost no more than 80p for a journey and can be found waiting where the main highway starts at Espargos and Santa Maria. They depart when full up, which can take a while, especially at night. It is difficult to find one plying to Palmeira, which depart from a side street next to the largest minimarket. 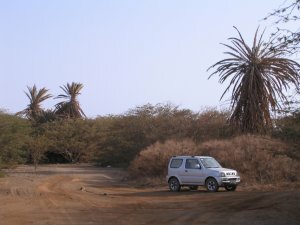 Hire cars need to be 4x4 to get anywhere interesting but they will take you to deserted beaches. Cost s are high because of the 100% import duties on vehicles . 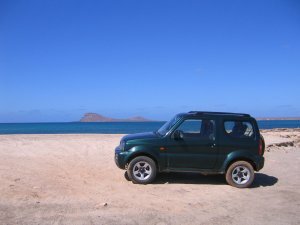 but a reliable Jimny can be obtained for £315 per week. Thuis can get you to spots like Burracona and the Pedra de Lume salt lakes, barely accessible in a taxi. These can be hired in Santa Maria. Enquire near the Ponta Preta apartments or Porto Antigo. 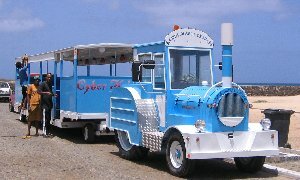 In Santa Maria there is a pretty road train which will drive you around behind the beaches and along the mai n streets.